Shirts With Random Triangles: Buffalo Wild Wings is an ex-bowl game sponsor. The Minnesota-based restaurant chain has been the sponsor of the bowl game originally called the Copper Bowl since 2012. The bowl was formerly been called the Insight.com/Insight Bowl (1996-2011). Earlier title sponsors include Weiser Lock (1991-1995), and Domino's Pizza (1989-1990). No reason for Buffalo Wild Wings severing its association with the bowl game, though The Arizona Republic noted that the cost of naming rights to bowl game have been escalating. The now ex-Buffalo Wild Wings Bowl is owned and operated by the Fiesta Bowl, which also recently lost Tostitos as a title sponsor. 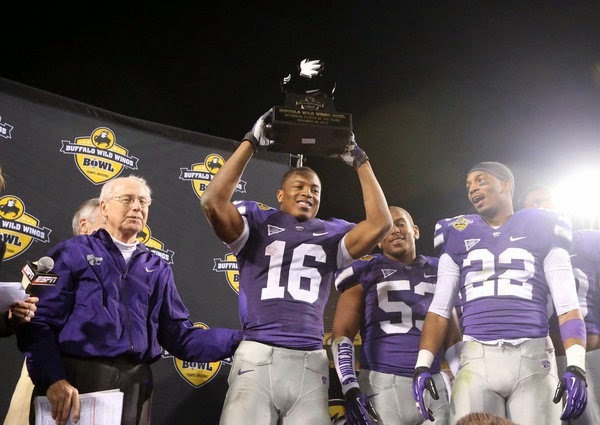 Kansas State defeated Michigan in the 2013 Buffalo Wild Wings Bowl 31-14.